Sixx AM may have one of the most dedicated fanbases in all of music- not just rock. Their music is personal to the level that anyone can connect with it and relate to it on a very seminal level. Earlier this year they released the first of a double-album set with Vol. 1: Prayers for the Damned and embarked on their first world tour. 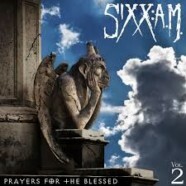 Now, they’re set to release Vol 2:Prayers for the Blessed and, much like it’s predecessor, it lives up to everything you’d expect from a Sixx A.M. album. While Vol. 1 had a darker feel to it, Vol. 2 has that same dark vibe but also has a positive tone to many of the tracks. The record opens strong with “Barbarians (Prayers for the Blessed),” which is an arena anthem waiting to happen and leads right into “We Will Not Go Quietly,” the first song released from the record. With these two tracks alone, you know right away this album is going to rock and its going to rock hard. We also know pretty early on that Sixx A.M. are here to make a statement and have a lot of emotions running on this album. “Wolf At Your Door” is an adrenaline rush leading into the first ballad of the album with “Maybe It’s Time,” which is the first of a few very strong ones on this record. Those open the door for “The Devil’s Coming,” which is by far the standout track of this album. It’s got a perfect tempo and is one of the heaviest songs the band has written yet. It’s an addicting track that you’ll put on repeat and play long after the album is in the rear view mirror. One thing that has to be noted is how strong the ballads are on this album. “Suffocate” isn’t a complete ballad but it’s right up there with some of Nikki Sixx’s strongest songs. There isn’t a weak track on Vol. 2 and it’s by far one of Sixx A.M.’s best albums yet. At the end of the day and when their careers are over, this will stand right up there with The Heroin Diaries Soundtrack and This Is Gonna Hurt– which are considered to be the quintissential Sixx A.M. albums.